D-PRE is based on London Power's Mini-Marshmallow amp, which was a tribute to Howard Dumble. The basic topology is here with typical values. Although many amp designers used the "overdriven Fender amp" as the basis for the preamp in a master-volume amplifier, Howard's is the most famous. D-PRE provides two distinct sounds: classic warm clean and late-over-drive distortion. We've added an extra 'Drive' control to the Dumble topology, making it more useful to a wider range of players. Two 12A_7s provide all functions in a pure tube audio path. Use two RLY kits for basic mechanical relay switching, to switch between the two sounds. 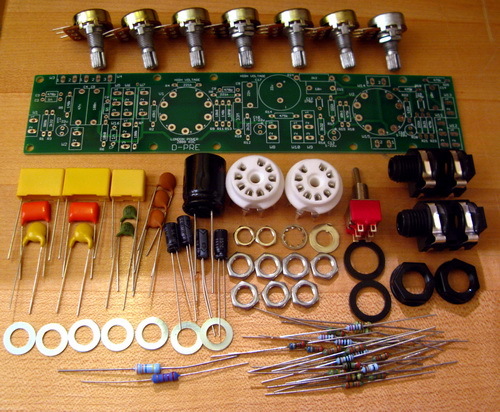 Use our PSU-PRE Power Supply Kit for Tube Preamp or similar to build a stand-alone preamp. Would you like to receive this pre-assembled? Add PRE2-BLT to the order.